A trashcan-shaped computer may not be the first thing that comes to mind when thinking of a workstation desktop but that is exactly how Apple has envisioned the workstation of the future. The Mac Pro has been Apple’s most expensive Mac computer since the first one was released in 2006 and with its latest revision, the Mac Pro 2013 is bringing performance and style to a new, futuristic level. Design-wise, the Mac Pro is clean, sleek, and stylish (for some), which is a complete departure from the old, silver, and bulky chassis that contained the original Mac Pro. The 2013 Mac Pro is only 10-inches tall and is following an overall market trend towards smaller computers with its black, cylindrical chassis. While an argument can be made that the Mac Pro is not innovative when it comes to performance or specs, there is no arguing the the Mac Pro’s design is completely new. As interesting as the computer may look from the outside, the real impressive parts of it are on the inside. 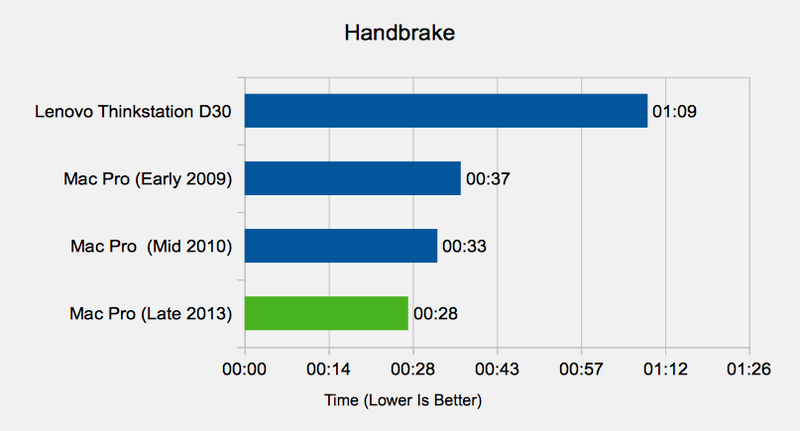 Apple’s unified heatsink is something that is rarely seen on any mainstream computer and from my knowledge, you simply cannot buy any other computer that is built in this way. The unified heatsink and fan setup is responsible for the cylindrical design of the computer and as a result, cooling the CPU and dual GPUs is not difficult. Though it may not be completely unique, Apple’s minimalistic style with the new Mac Pro allows for very efficient cooling with cool air coming in from ports on the bottom and then hot air exhausting from a larger fan near the top of the chassis. Despite having multiple power-hungry components present inside, the Mac Pro handles heat and sound without any trouble keeping it relatively cool and quiet even under heavy loads. This cooling-centric design is definitely one of the best on the market, especially for workstation computers. There are more than enough ports present on the rear panel of the new Mac Pro, including two Ethernet, HDMI, six Thunderbolt 2.0, and four USB 3.0. While the USB ports are nothing special, having six Thunderbolt ports is quite nice not only because they are capable of handling RAID storage systems but because they support up to three 4K monitors or six Thunderbolt monitors. Along with the ports themselves, Apple has added lights to the rear panel so that the ports will light up when the system is moved. This makes it easier to find the ports, however the new Mac Pro is small enough that it can be set on a desk, making it easier to plug-in external devices anyways. As different as it may look from the 2006 and 2009 versions of the Mac Pro, this computer is still made completely out of aluminum (except for plastic near the top.) The only actual difference then, is that Apple has shaped the device to accommodate more efficient cooling and to change the look of the new Mac Pro, an anodized black finish was added. Unlike what some would expect from a device like the new Mac Pro, there are no special screwdrivers necessary to dig into the chassis. Instead, the back opens up with one simple latch, exposing the main components of the computer. While there is practically no upgradability with the GPU and CPU, Apple allows customers to add or remove memory as necessary, leaving four DDR3 DIMM slots open with support for 64GB of RAM. Connectivity has always been a strong suit for Macs and that is definitely the case for the new Mac Pro as well. Apple has equipped the computer with support for Bluetooth 4.0 and AC1300 Wi-Fi, ensuring that the computer remains future proof at least for a few years. 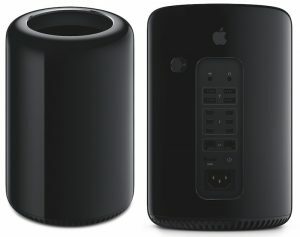 Design, connectivity, and features are a big part of the new Mac Pro but since it is a workstation computer, performance is still a major part of the device. 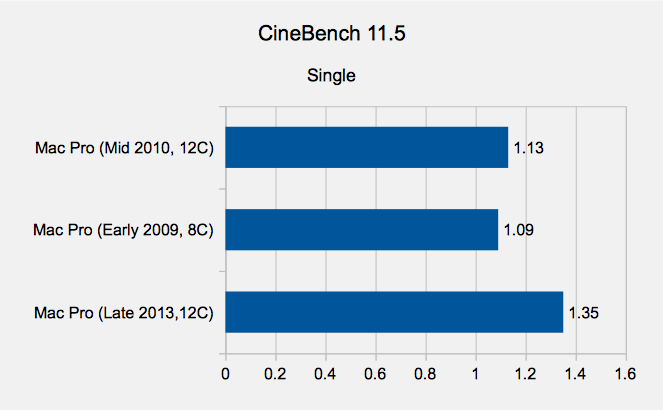 To test its performance, we ran Cinebench 11.5 (single and multithreaded), Battlefield 3, and Handbrake in order to see how the Mac Pro would do in various situations. 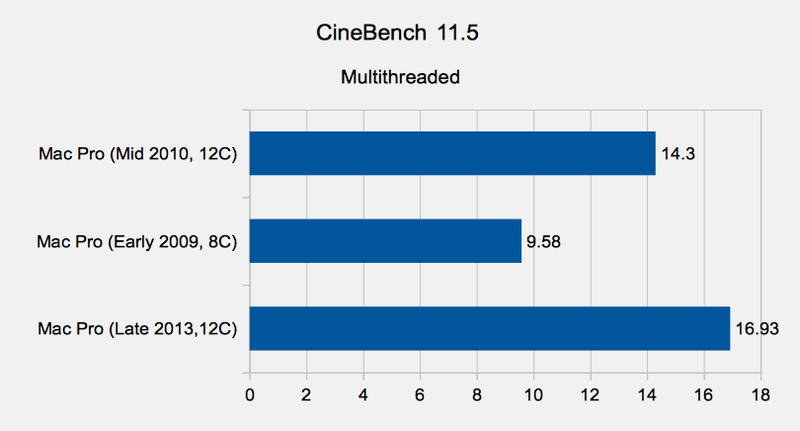 As expected, single core and multicore speed on the new Mac Pro with its Intel Xeon E5 processor is far above its predecessors. Although it makes that the Xeon E5 performs well, it is a much more significant improvement than you would normally find with a new Mac Pro. While it may be a $3000+ computer, the Mac Pro shines in media editing and its FirePro graphics cards are not built with gaming in mind. 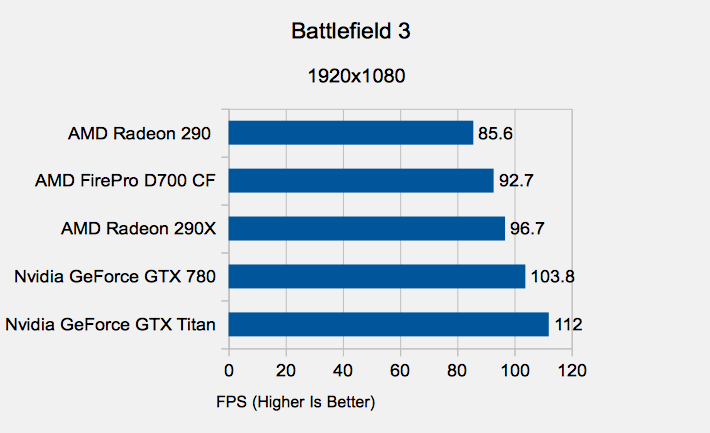 However, crossfire GPUs still have enough power in them to perform well in most modern games, as seen with the Battlefield 3 test. It has been years since Apple came out with a new Mac Pro and unlike its previous upgrades, the 2013 Mac Pro is truly different inside and out. The changes present in this OS X workstation make it a viable option for any video editor or general business person. While Windows workstations may be a better option for number crunching, if you are working with pictures or videos, the new Mac Pro’s dual FirePro graphics card can handle pretty much anything. The average consumer definitely does not need to pick up a $3000+ Mac Pro but if a workstation is at the center of your daily workload and you happen to prefer the OS X eco system, then the new Mac Pro is a great choice.